SteelSeries have a reputation to uphold within the peripherals market, one that they’ve earned over the years, producing good, high-quality hardware for different consoles and the PC. We can safely say, in our opinion, that reputation is in safe hands with the Stratus Duo. Starting with the positives, we love the Hall Effect magnetic triggers; they provide a much better sense of feel and accuracy than anything you would find on the Xbox One or PS4 Dualshock controllers. We also found the analog sticks to be just a bit better as well, not as night and day as the triggers are, but lovely and fluid for accurate use. The A, B, X and Y buttons feel as you would expect and the overall shape is comfortable for hours of use; we especially liked the smooth, one-piece back of the controller. Wireless communication, with both the Galaxy S9 and the included USB adaptor was rock solid, both in terms of setup and reliability, we noticed no dropouts while gaming over the two weeks of testing we gave the Stratus Duo. Build quality is exactly what you’d expect for £59.99, there’s very little flex or movement, even when giving it some serious abuse, and all of the components feel great, aside from the D-Pad, at which point we’ll go on to note some points where SteelSeries could perhaps improve. First off, we want to see vibration feedback at this price point, while it’s a little more expensive than the Xbox One pad, it does provide compatibility with Android and Windows, as well as arriving with a built-in lithium-ion battery and its own 2.4GHz USB adaptor, but that doesn’t excuse the lack of vibration feedback. We would also like to see it supported on iOS devices, which their Nimbus is capable of. The flashing LEDs while using it with a Galaxy S9 was off putting at first but it quickly developed into downright annoying. We attempted to fix it via a restart but it persisted. Unfortunately, we don’t have another Android device here to try it out with to test for a slight incompatibility, but with the S9 being one of the most popular Android devices out there, running the standard operating system, we’d expect it to work flawlessly. Also, if we’re being fussy, an audio passthrough for headset use, much like the Xbox One and PS4 controllers feature, would’ve been a good feature. That’s something we have used on both controllers and will continue to use as time goes on so is a shame to see it missing from this device. As a final touch, perhaps giving a choice of colours, much in the way they do with their headsets, could see improved sales, allowing a little personalisation while out and about, black should suit most users needs but a choice of colour cannot be faulted, however, we can’t exactly mark it down for this either. 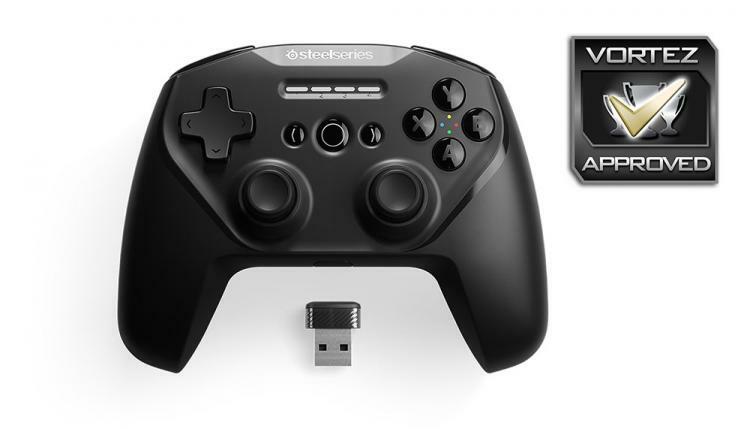 We’ve thoroughly enjoyed using the SteelSeries Stratus Duo, it’s a well-made, comfortable, accurate and dependable controller with decent battery life and solid wireless connection, but at £60, roughly £15 above the PS4 and Xbox One controllers, you really do need to be using it for both Android and PC to get your money’s worth from it, but even then, the extra £10 for the SmartGrip pushes it further from a desirable price point.